What image first comes to your mind at the word “blessings”? But let me ask you, where does that leave the one with no husband, no children, bad health, or no bank account? when I lost my health, and then my husband lost his job, and subsequently our home. Are we no longer blessed? Or is this when the true blessings became a realization? Early on in my journey with chronic pain, my son introduced me to Laura Story and her song, Blessings? She proposed through song that the blessings were not the tangible things but the divine things. I venture to believe that she is right. In our pain and loss, we actually found the TRUE BLESSINGS of God. we found His GRACE to walk through the valley, and so much more. … I found was a deep, DEEP RELATIONSHIP with the God of the Ages. I found His LOVE for me so sweet. His tender FORGIVENESS for leaving Him behind in the dust as I “ministered to others in His Name”. You see, I really wasn’t doing it all in His Name. I wasn’t leaning on Him FOR GUIDANCE and DIRECTION. I had taken hold of the reigns and was running the show myself. But, oh the JOY, I found in being still before Him. I found HIS WORD so fulfilling. What an amazing God we have. And so many do not even see it. And so many do not even see it. Here’s an old hymn we seldom sing anymore. Even then it was only sung at Thanksgiving. But truly it is a song for lifting one another up. See if you don’t agree. It’s a great hymn. We sang it alot too. I love the song “Count Your Blessings” and we used to sing it a lot when I was growing up. There are blessings to be found all through our lives. Sometimes the hardest struggles help us see God more clearly. We lean on him and find peace. Blessings to you! 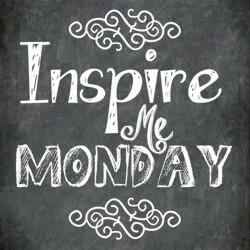 I’m your neighbor this week at #InspireMeMonday! In the darkness the blessings mean so much more to us. Thanks for dropping by. Exactly GG. There are blessings all around no matter where we are in life or what we are experiencing. Beautiful – thank you for your inspiration and perspective. God bless you too. Have a great fourth. Amen! He has been showing me many of those same Blessings as I journey through Chronic Illness. Stilling in His Presence brings such a deep love. You are in my prayers dear Fellow Traveler! That’s one of my fave songs! I’m over in the 11 spot this week!